Plans have been submitted on their behalf by Studio Architecture to the Downtown Design Review Committee to be reviewed on November 15. The Scope of Work for this project includes the interior and exterior renovation fo the existing 17,000 SF building located at 400 N. Walnut Avenue in the Deep Deuce District. 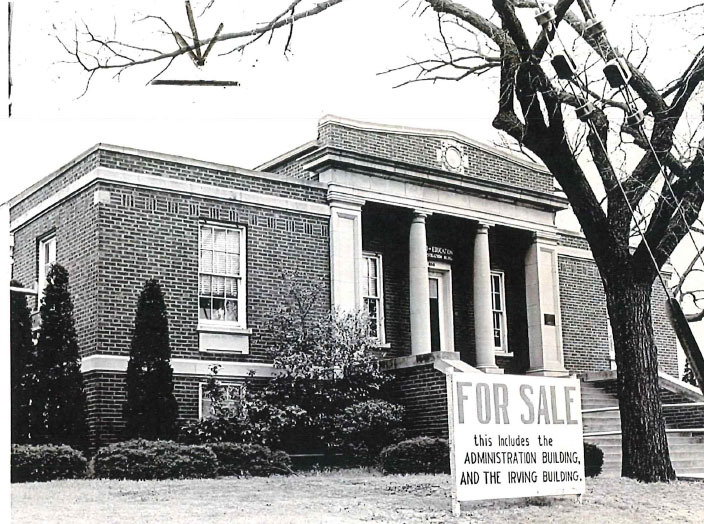 The original building was constructed in 1919 and housed the Irving School on the first floor and the Board of Education Administration Offices on the second floor. The addition to to the back of the building was completed in 1930. During the Cold War, the buiding was used as a Civil Defence Center. It was the first permanent home for the Oklahoma City Schools' Administration. It is the only remaining building directly related to the original Irving School, which was built in 1896, and was Oklahoma City's first high school. The Irving School burned down in 1937. 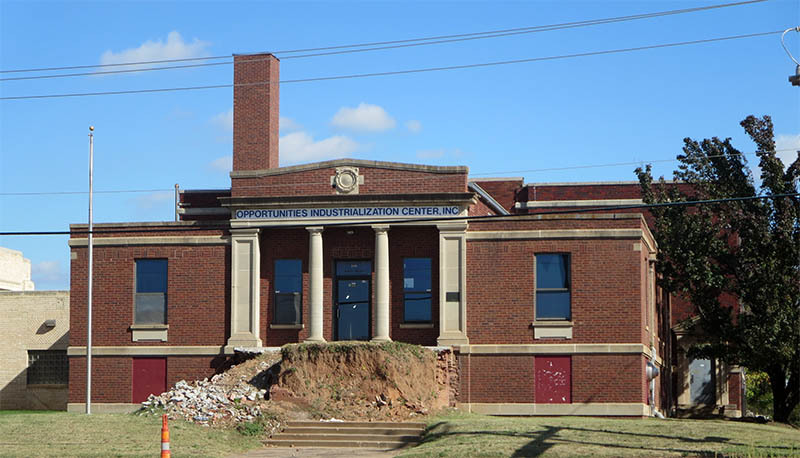 It is one of the few original buildings remaining from the 1890-1920 time period of school construction in Oklahoma City. It is one of the few original buildings remaining within the Deep Deuce District. Building was designed by Layton & Smith Architects. At some point in the building's history, the original front entry steps were modified. In 2015, the front entry steps to the building were removed without a permit and all the interior partitions were demolished. 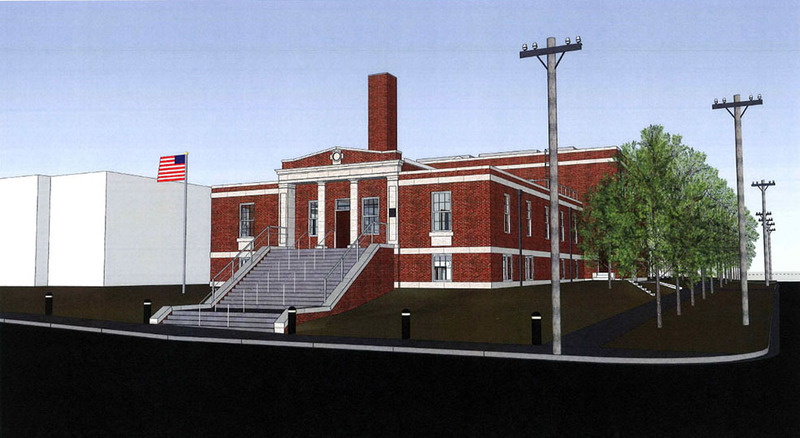 The building's current owner will reconstruct the front entry steps to their original design and renovate the interior to be used as offices. Interior renovation work includes new office layout with new finish materials: partition/wall construction, new acoustical ceiling “clouds”, flooring, lighting, a new elevator, plumbing fixtures and HVAC. The interior desing includes exposing brick walls and concrete beams and columns of the existing structure to contrast with modern finishes of polished concrete, glass, and metal. Exterior renovation work includes the reconstruction of the main entry steps on the west facade of the building. Reconstruction of these steps will incorporate salvaged brick from the steps that were demolished in 2015 and will be based on the original design by Layton & Smith Architects. In order to meet current buidling codes, new handrails will be provided. Existing aluminum windows will be removed and replaced with new windows that will replicate the building's original “six over six” styled windows. New windows will be high performance with clear insulated glaizing. Frames and mullions will be white to mathch the building's original windows. The orginal building's clerestory windows will eb slavaged and repaired, if possible. If these windows are determned to be damaged beyond repair, they will be replaced with new windows to match the finish and character of the orignal windows. 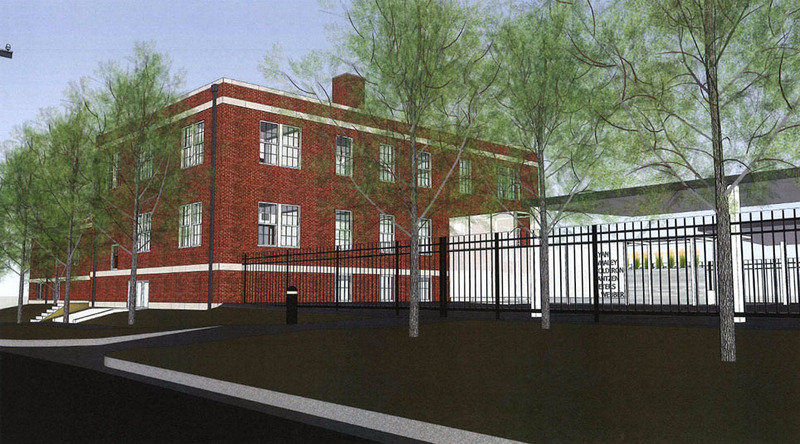 The existing front entry door on the west facade will eb replaced with a new wood door that matches the finish and character fo the original building's entry. On the buildin's south facade, the existing metal overhaed door will eb replaced with a new fixed prefinished aluminum window wall system. This system will incorporate clear insulated high performance galzing. Glazing will be divided into lites that emulate the appearance of an operable overhead glass door. Frames and mullions shall be white to match the building's other windows. 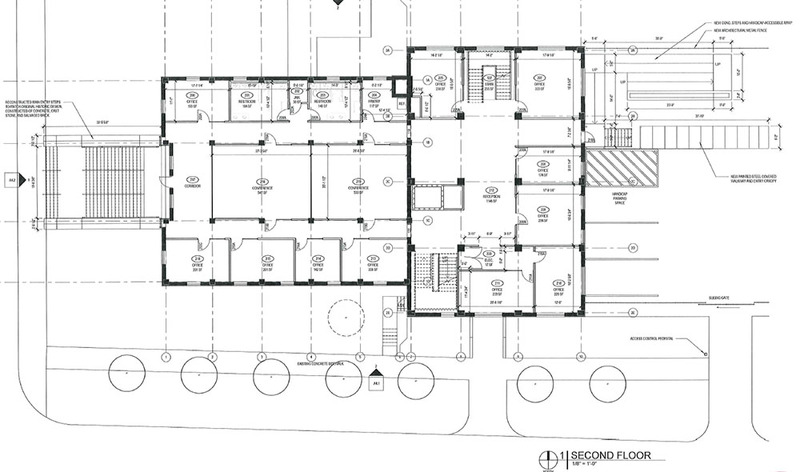 A new ADA accessible entry will be constructed on the east facade of the building, adjacent to the existing parking lot. The new entry includes steps and a handicap ramp. Bothe the steps and ramp will be cast-in-lace concrete. 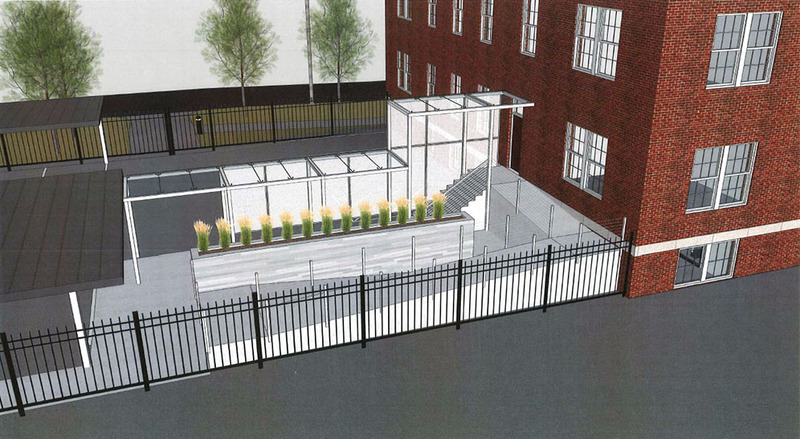 Handrails for the steps and handicap ramp will have painted steel posts and stinless steel handrails with stinless steel cable infill to maktch the handrails at the reconstructed entry steps on the west facade and the guard rails at the second floor rooftop patio/deck. The new steops and landing will be connected to th adjacent parking canopy with a covered walkway. The structure of the covered walkway is painted stell farme with a tempered glass roof. 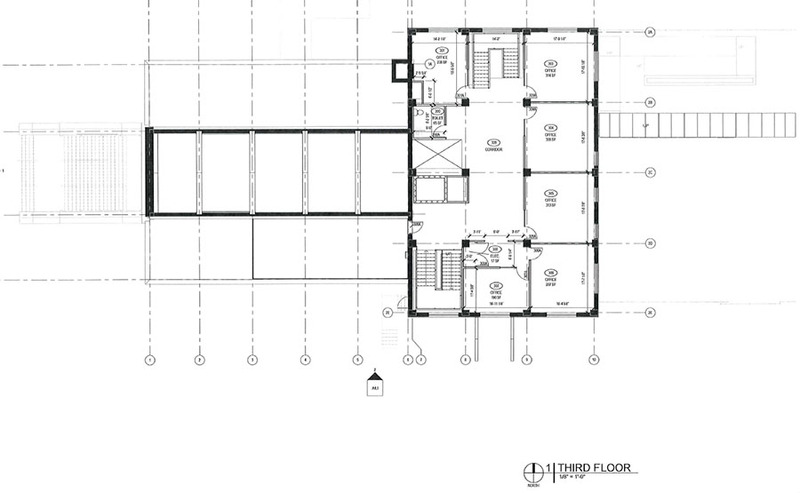 A rooftop patio/deck will be constructed on the top of the second floor of the original building along the south side. 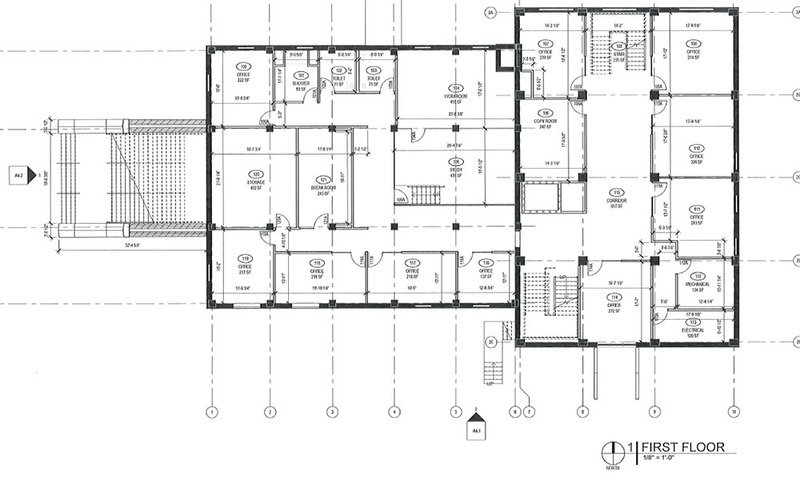 The rooftop patio/deck is approximately 500 SF and is accessible from the third floor. The existing parking lot on the east side of the building will access off of NW 3rd Street. Steel canopies will be installed to provide covered parking for 27 vehicles. Street trees will be planted along NW 3rd Street within the Streetscape Zone. Additional landscaping/planting beds will be located adjacent to the reconstructed man entry steps. A monument sign is planned for the site.